The journey continues from part one…….. Feeling a bit peckish we perused the menu. There is something really special about eating in the restaurant car of a train. I automatically think of Alan Whicker and Murder on the Orient Express, tuxedos & pianists & champagne whenever I frequent one at night. This wasn’t as salubrious as that, but at least we had (fairly clean) white tablecloths and matching napkins. The not so smartly dressed waiter took our orders – lamb stew for me, rice with cheese for Hamish. My meal was delicious, but Hamish’s was pretty unexciting – bland rice with a processed cheese square plonked on top. Beer munchies were suitably assuaged however, so it was time for bed. Since then I only have to listen to the opening bars of ‘Morning’ to be instantly transported back to that snowy mountain scene viewed on my magical train ride. We both went for ‘special breakfast’ of hard (and I mean hard) boiled egg, bread roll, gherkin, olives, tomato, soft cheese, apricot jam “portion, butter, watery orange juice and unlimited coffee. I also benefitted from an extra portion of spam courtesy of Hamish! We ate the lot, despite both snapping our plastic knife trying to spread the rock solid butter on the roll. As we drank our coffee, we recalled the dramas from the previous evening and contemplated what might have been. We could now be waking up in a grotty hotel in Ankara with a feeling of foreboding about what events would unfurl that day or we could still have been blissfully unaware of the traumas that lay ahead as we tucked into our fodder. Maybe the policeman in Ankara would also have been contemplating what to spend his windfall on whilst laughing at the picture of my big-eared mate. We thanked our lucky stars once more and vowed to have a fantastic time in Syria to celebrate our good fortune. It was now time to sit back, enjoy the ride and take in the views. Wayne joined us with a cheery good morning and for once at that normally grumpy time of day, we reciprocated. None of us was 100% sure where to catch the bus and how to get there from Adana train station. We agreed to stick together and then share a taxi into Aleppo from Antakya. That’s where the conversation stopped. Seemed I never could get rapport with mathematics teachers. We had drunk more coffee than was good for us so made our excuses and returned to our compartment via the not be dallied in facilities, before arriving in Adana about an hour later, two and a half hours behind schedule. The bus station was a twenty-minute walk away. Upon arrival there, tickets were procured for the journey thirty-minutes hence. This was just enough time for a quick falafel and a plate of hummus (to which I am addicted of course). With our fill of chickpeas, we were off. The journey to Antakya took an hour or so. Hamish tried to teach me how to tell in which direction we were travelling by the position of the sun. He quickly lost me, but eastwards was good enough for me! The city was built out of the ruins of ancient Antioch famed in biblical times as the base for Paul’s missionary journeys, where Jesus’ followers were first called “Christians” and where the Gospel of Matthew was reputedly written. Not much from that time survives in modern day Antakya, but we had no time for that anyway as it was high time to find a taxi and negotiate the fee for a ride through border control about twelve miles away, and on to Aleppo. This is where Wayne came into his own. Without the need to revert to calculator, logarithms or abacus, he negotiated the taxi fee down from $80 to $45, just $15 each. 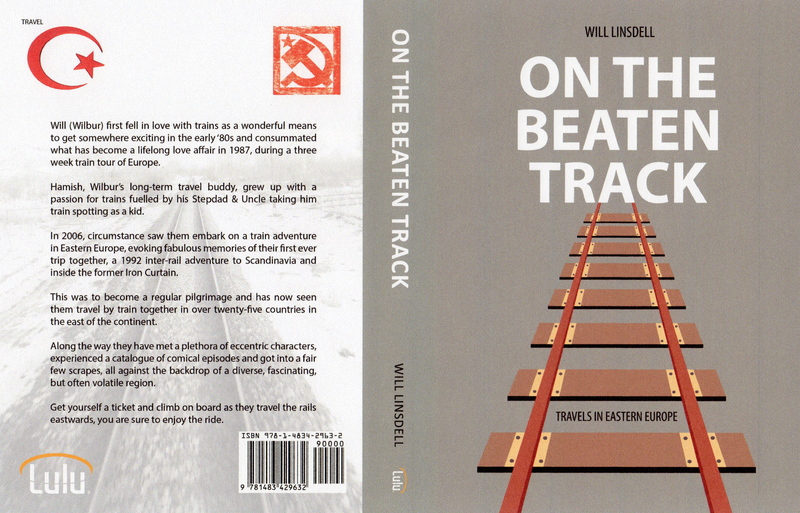 This is an excerpt taken from my book ‘On The Beaten Track’ recounting over 15,000 track kilometres in the east of the European continent. It is available from Amazon via this LINK. I will be continuing the journey through Syria over on Wilbur’s Travels. Hate to think what Aleppo looks like now! Me too. Will concentrate on what I saw rather than lamenting the awful situation.